Babblings of a Mommy: "IT'S SO FLUFF-YYYYYYY!!!!!" 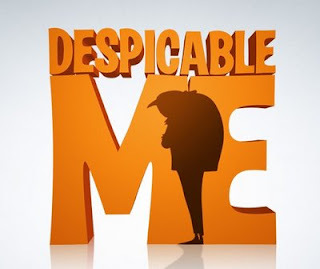 This weekend we took my daughter to see Despicable Me and I can't stop saying "IT'S SO FLUFFYYYYY" since. Shrek has "Do the ROAR" and Despicable Me has "It's so Fluffy" as the quote that you will leave the theatre saying over and over. I was surprised how much I liked the movie, especially since a few weeks ago I had no interest in watching it whatsoever. I thought it was going to be another lame movie the big production companies were putting out there just to make money off kids--but I actually really liked it! I'm even going to go as far as saying it's now one of my favorite kids films! Have you seen it yet? Oh! Last week my baby won a prize for her "Summer reading". I enrolled her in this program where depending on how many books she reads (actually how many books I read to her) you get tickets for a weekly drawing, and she won the weekly prize! The prizes are nothing big but you should have seen how excited she was to have won something--So Cute! I have been debating on taking my kiddos to see this. I think we need to get out to a movie seeing as it has been awhile and this one looks ok. Now with your review I am thinking that we will be there over the upcoming weekend! Despicable Me was great! I was kind of surprised at how good it actually was. Can't wait for the sequel. MZ: Me too! I had really low expectations of this movie, maybe that's why I liked it so much--because it was totally unexpected! My weekend wasn't as fun as yours, but close! I took the kids school clothes shopping, yikes! The 2 boys were super easy...just give them Wal-Mart and they're good to go. My 2 teenage girls were different...the Mall and every store in it!